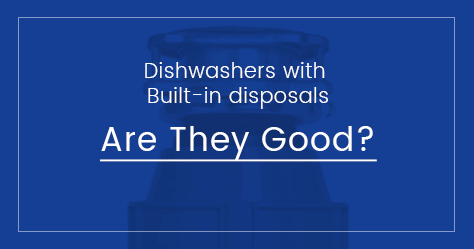 Do you need Dishwashers with Built in Disposals? Do Dishwashers Have Built-In Garbage Disposals? This is a general question I hear every day. Yes, there are dishwashers with built-in garbage disposals; but not so many. Most people prefer a dishwasher with a filtration system while some like them with built-in garbage disposals. Do you need a dishwasher with a built-in garbage disposal? Well, the choice is personal. For example, there are printers with built-in scanners, but I buy them separately, why? Because if one of them is damaged I can repair them separately and use the other but if a printer with a built-in scanner is damaged that’s more troublesome. These built-in disposals are also not powerful, not nearly as an independent disposal. They are more or less a metallic extension of pump impellers. They can’t grind any serious food wastes; actually, they don’t need to because people put their tough food wastes into trash cans or garbage disposals before putting their plates in the dishwasher. So in the latter case you need a real disposer anyway. So the best solution is; Dishwasher + Independent garbage disposal, don’t go for the built-in ones. Instead, connect the outlet of the dishwasher to the garbage disposal, all disposers come with a dishwasher connection. This will help you to grind tough food items as well as those coming out of the dishwasher. This solution has certain advantages like; ease of repairing, ease of cleaning and is more economical as dishwashers with built-in disposals cost more. You can buy a good but cheap disposer for that price difference. As mentioned before this is a personal choice. I prefer an independent dishwasher and an independent disposal and connect the dishwasher outlet to the disposal. You get the same result but fewer headaches. 3 Bolt vs EZ Mount – Which is Better?